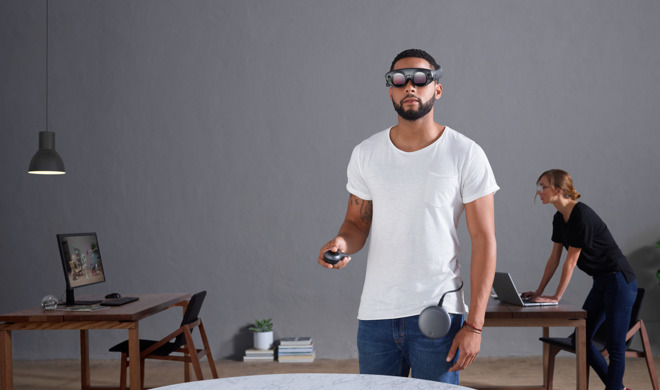 A Magic Leap AR headset. The headset —still in its early phases and first discussed in November 2017 —is expected to use 8K displays for each eye, and a processor faster than any Apple currently makes. The product has once again been codenamed "T288," and is said to be targeted for a 2020 launch. Sources familiar with the matter told CNET that in its present form the prototype box looks like a PC tower. To overcome some of the obstacles of VR systems like the HTC Vive and Oculus Rift, all of the sensors needed for motion tracking will be built into both the headset and box. The Vive and Rift depend on external satellites to detect full-body movements. Because of the bandwidth demands of AR and VR, and to avoid cables, Apple's system will allegedly use 60-gigahertz WiGig. It could potentially use WiGig 2.0, or 802.11ay, which should be finalized in 2019. Apple's processor for the device is expected to use 5-nanometer technology, half the size of the process used in the iPhone X's A11 Bionic. TSMC is allegedly starting its 7nm process this year —but confirmation of that may need to wait for the 2018 flagship iPhone releases. In the past year Apple executives like CEO Tim Cook have expressed a strong interest in AR. The iPhone 8 and X were engineered with it in mind, and the company has also released ARKit, which simplifies AR development on iOS. Numerous AR- and VR-related patents have been published, among them ones for eye tracking and partial display updates. The headset itself has been more mysterious. The November report was the first to mention the T288 name and 2020 window and also said that the device uses new software dubbed "rOS," and may use of a mix of Siri commands, head gestures, and/or a touch panel for control. 8K eyepieces would put Apple's products well beyond current hardware. The Vive Pro, for example, is already sharper than most VR headsets with a resolution of 1,440-by-1,600 pixels per eye. The set is nevertheless bulky, and can only go wireless through an optional adapter.